Drive North on Hwy 19 to Junction of Hwy 19 and Hwy 270. Turn Right on 19 towards Waimea. 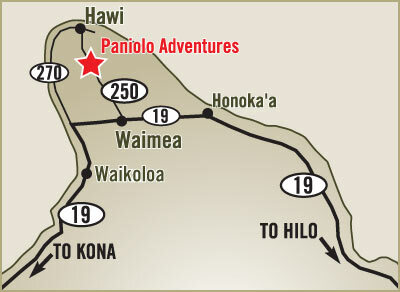 Turn left(north) on Hwy 250 towards Hawi. We are the Red Barn on the left, 300 yards past mile marker 13 on Hwy 250. From Kona 1 hour 40 mins. From Captain Cook 1 hour 50 mins. Drive North on Hwy 19 towards Honoka'a. Continue on Hwy 19 into Waimea. Turn right at third traffic light (Shell and Chevron on corners) and continue on Hwy 19 approx. 2 miles. Turn right (north) on Hwy 250 toward Hawi. We are the Red Barn on the left, 300 yards past mile marker 13 on Hwy 250. Drive Time: 1 hour 45 mins.